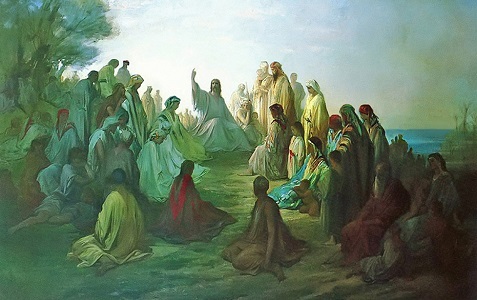 I could be wrong – but I don’t think so – but it strikes me that the whole lot that has been written about the first beatitude in Matthew – Blessed are the poor in spirit, for they shall inherit the Kingdom of God – is mostly about spiritualizing poverty. Making the state of material want a holy state. The problem for this for me is multi-layered. First there’s the harumphing around the idea that somehow being poor – having no access to good dental care, being limited to chicken wings (if you’re lucky), doing your best to make do with two pairs of underpants – somehow makes you a better person. Could it be more the idea that you’ve struggled all your life, you’ve done without, so now that you’re dead, God’s going to let you sit in the Holy Sauna in Heaven while your pâté is served to you by never-surly angel-waiters. Yeah. See. This just doesn’t make any sense to me. Because let’s face it. There are a whole lot of mean poor people out there. And there are rich people who spend their money doing good for their neighbors. So holy holes-in-the-knees poverty can’t be a real concept. Not real at all. One problem that I see with the Bible is that a whole lot of stories in the Old Testament can be taken on a relative basis, that is, Moses in a basket is just that: a baby Moses in a basket. It doesn’t take that much mental strain to see what’s behind this whole thing: infiltrate the enemy’s camp. And then take it down from the inside. And start really, really young. But once we get to the New Testament, once we do our best to crack open the Gospels, with their red type screaming lessons at us, we have to set aside our confidence in ourselves, thinking that we know what is going on. Because it strikes me that what the red type is really screaming is that we really don’t know what’s going on. And that is because of the difference between God’s absolute nature, and our own relative nature. Oh, how we love to put things into terms that we understand. That we can manipulate. That we can control. I remember the first time I heard the beatitudes read out in church. I almost fell out of my pew. Because what I heard and thought was: Blessed are the meek– SO WHAT’S UP WITH THE ARROGANT? Are they cursed? I figured that the opposite of blessed is cursed. Because it struck me that pretty much no-one was listening to that side of the lesson. But now that I am older (yes, and wiser) and subtlety has bashed its way into my thick bull’s head, I look at what has to be: that these lessons are absolute teachings of God. Which means that they have to apply to everyone at all times of history. And what fascinates me about that is that when we are given absolute teaching, we have to encapsulate it in our own relative brains. Like a mosquito encased in amber. Here, when we read the beatitudes, we, as I did as a child, think of the comparison that is being offered. If we are poor in spirit, then we’ve got it made in Heaven. If we are, um, rich in spirit, then, what, we have to sit in the bleachers? It’s there, whether we like it or not. The comparisons that are thrown to us in the beatitudes that land like a lump at our feet. But, as I wrote just a few minutes ago, those comparisons can’t work. They eliminate absolute values. So these comparisons are just illusions. We cannot define the concepts in the beatitudes in terms of what we have come to know through the experience of our lives. So, what then, is the absolute value of poverty? And how does that apply to our soul? And how can we truly understand that while in normal life, more it better, here less is better. Or so it seems. Or are we clever and make it flip: the more poor in spirit I am, the better. Can’t work in terms of God. In his quite short, yet amazing, book, Poverty in Spirit, Johannes B. Metz proposes that when Jesus flouts Satan’s challenges, that he is reducing himself to the true state of man, and becomes, accordingly, poor in spirit. He brings himself down to a state of being able to do nothing. And so I wondered, is our spiritual impotency, that is compared with Jesus’s spiritual wonder, the true expression on Earth of poor in spirit. We cannot raise our hand and by doing so, bring someone back from the dead. Or make demons infesting a person come out and go into a passel of pigs. We know that Jesus can do these things (and more), so why then does he shut down just because Satan is around? It is an interesting situation to ponder: Jesus so very capable and proven to be so, but in this case, he becomes an ordinary man with hunger pains, an aching back, and nothing to show for it. And by extension (going backwards), was our expulsion from Eden, in truth, just the beginning of our learning that we are nothing without God? Was it a seemingly never learned lesson that we are, at the base of our existence, absolutely impotent? That we are in every spiritual term there is, nothing. Metz goes on to describe Jesus in his Passion as the ultimate expression of the concept of poor in spirit. He is alone. He receives minimal help from others. He cannot change the destiny that is laid out before him. It was written, and Jesus walks the words to their ultimate destination. Do we, then, come to our own poverty of spirit when we completely surrender to the book of our life that God has written for us? Is the attainment of the ideal of being poor in spirit achieved by stopping ourselves from insisting on asserting that we know what’s best for us in our lives, instead of allowing our lives to unfold before us? Is our ultimate destination in life the place of kneeling down and saying to God, I can do nothing without you? Excellent written! But does the concept of poor in spirit oppose the prevalent Christian manifestation in USA? Being poor on spirit also means being poor in human spirt, allowing the Holy Spirit to prevail in our lives. Be blessed as you have blessed me!